Beat the end-of-summer blues by taking one last family field trip to the Leonardo Museum. 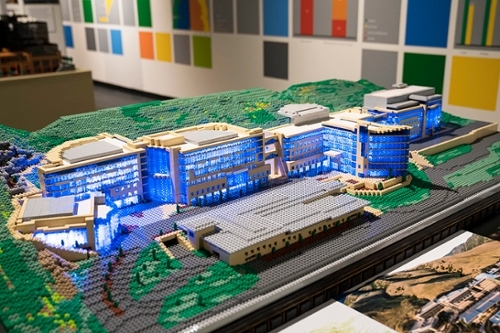 In the City Blocks exhibit, you can see Huntsman Cancer Institute (HCI) and other iconic buildings in Salt Lake City made entirely out of LEGO® bricks. Architecture firm Arch Nexus designed HCI. Artist Josh Allred, who has worked on the HCI project throughout his career at Arch Nexus, planned the LEGO® build of HCI and assembled the model. It was painstakingly built from more than 47,000 individual bricks and took 250 hours to complete. “So many people at Arch Nexus have had some kind of connection to HCI, whether they know somebody who’s been a patient there or they worked on the architecture and construction documents. It’s just close to all our hearts,” Josh said. HCI was recently named one of the top ten most beautiful hospitals in the nation. You’ve likely seen it in person, so don’t miss your chance to see it built out of LEGOs®!